It’s tempting to say that voters have made up their minds and that the presidential vote is set. Hillary Clinton has a 6.6-percentage-point lead in the popular vote and an 87 percent chance of winning the Electoral College, according to our polls-only forecast. A week ago, those numbers were about the same: a 6.4-point lead and an 85 percent chance. In our polls-plus forecast, Clinton’s chances are 84 percent, up only slightly from 82 percent a week ago. Furthermore, although we have only a handful of polls that postdate the third presidential debate, they don’t show much change so far. The only national poll conducted fully after the debate — from Morning Consult for Politico — shows Clinton up 6 percentage points, the same margin Morning Consult had in their previous poll. A couple of the national tracking polls have moved a bit — but the movement has been in different directions. But it’s premature to assume that Clinton is locked into a 6- or 7-point win. It’s narrowly premature because there’s been only one full day of polling since the final debate, and that isn’t necessarily enough time to show any further shifts in the race. And it’s broadly premature because there’s still a lot of uncertainty in the outcome. Wait — I hear you saying — didn’t you just tell me that there’s an 87 percent chance Clinton will win? That doesn’t sound like all that much uncertainty. Well, it depends on your tolerance for risk, I suppose. Donald Trump’s chances in our model are about 1 in 7, and you’d expect a candidate with a 1-in-7 chance to win about one presidential election every 28 years.1 So while it would be a rare occurrence, we’re not quite in once-in-a-lifetime territory. But mostly I mean that, while Clinton’s in a reasonably safe position, there’s quite a bit of doubt about her potential margin of victory, both in the popular vote and the Electoral College. A Trump win, including cases where he loses the popular vote but wins the Electoral College. A Clinton win in the “Obama zone,” wherein she wins the popular vote by 4 to 7 percentage points — the margins by which President Obama won the elections in 2012 and 2008, respectively. Clinton is all but certain to win the Electoral College if she wins the popular vote by this amount. Finally, a Clinton blowout, wherein she wins the popular vote by 8 points or more, which would almost certainly also yield a dominant performance in the Electoral College. The polls-only forecast currently shows Clinton in the “Obama zone,” but it also has her with only about a 1-in-3 chance of ending up there. If Clinton gains any further ground on Trump, then we’re really into blowout territory, with Arizona potentially turning blue, perhaps along with more exotic options. But the race could also tighten — or the polls could be overstating Clinton’s advantage. (Or both, in which case Clinton could still lose.) Maybe there’s something to the argument that the race has tended to ebb and flow between narrower and wider Clinton leads, and that Clinton’s been at a high-water mark recently. I’m not totally sure that I buy it because of Trump’s lack of discipline on the campaign trail and the short amount of time left. But our model says to be cautious because of the still-high number of undecided voters and the broad swing state map, and that uncertainty could cut in either direction. The polls-plus model, in fact, still discounts Clinton’s lead slightly, expecting the race to tighten by a point or so. It has her squarely in the middle of the “Obama zone” instead of edging up against a landslide. 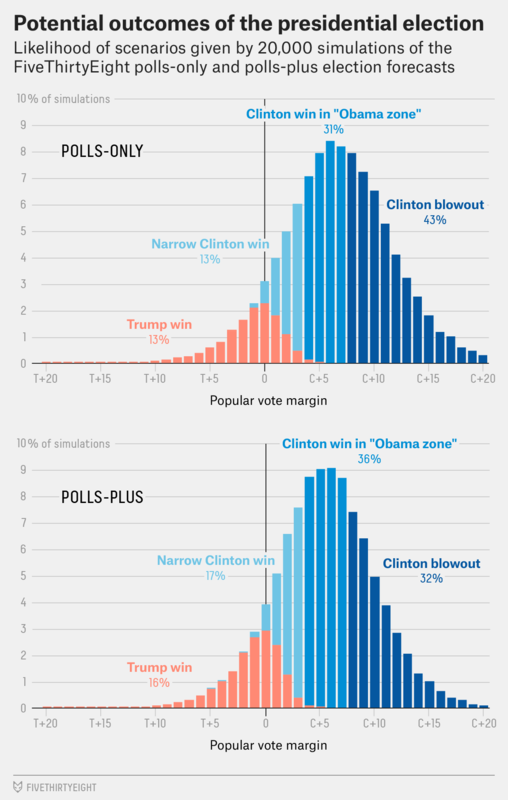 It also uses a somewhat narrower probability distribution, since the extra information that polls-plus accounts for theoretically improves the forecast’s precision. So it has her with a 36 percent chance of an Obama-type win, a 32 percent chance of a blowout, and a 33 percent chance of having to sweat — either a close call or a loss. The point is really just this: To say that Clinton has (roughly) an 85 percent chance of winning is not to say that she’s going to glide to victory 85 percent of the time. The 85 percent figure includes its share of close calls, along with a (larger) share of blowouts. It includes a few oddball scenarios, like Clinton winning the Electoral College while losing the popular vote.3 One benefit of having a 6- or 7-point lead is that a couple of things can go wrong — including somewhat inaccurate polling — and you can still win. I’ve borrowed this formulation from Drew Linzer. The numbers may be slightly different from the ones you’re seeing in our forecast now. Although the reverse case is more likely.